A ground-breaking pilot scheme transforming social housing into energy efficient smart homes has seen energy consumption slashed by over 80 per cent. The project, known as Retrofit Plus, has been carried out by Beattie Passive alongside Birmingham City University, InteSys Ltd and iZDesign to see how changes made to houses could cut heating energy bills and lift low-income households out of fuel poverty. 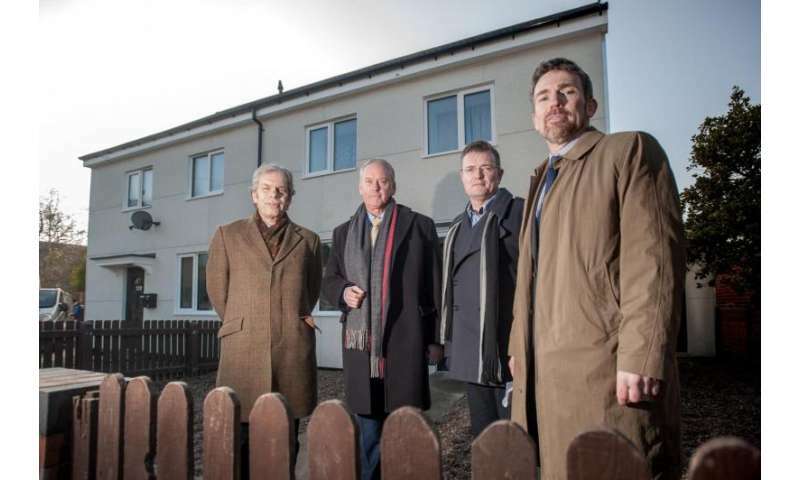 The process saw a range of energy efficient measures introduced including fitting the houses with Beattie Passive's innovative TCosy Deep Retrofit system. TCosy wraps entire buildings with a new insulated layer by installing a timber frame structure completely around the homes and injecting insulation material into the walls and roof cavity. This creates a continuous insulated layer around the building, eliminating heat loss and making the buildings draught free – forming a process which can be 'retrofitted' to refurbish existing homes. As part of the retrofit solution, new triple glazed windows and doors as well as a mechanical ventilation and heat recovery system were installed. The whole system was built to low-energy Passivhaus standards, offering advanced energy and comfort levels. They were also fitted with high-tech sensors and controls which automatically regulate the houses' temperatures as well as learning and reacting to residents' patterns of use. "I did not need heating when the outside temperature dropped below freezing yesterday." "The house feels like home now – no damp, no dust, no noise." It is hoped the scheme could increase the value of housing stock for councils and regenerate areas of deprivation by also fitting homes with high quality new facades. Ron Beattie, Beattie Passive said: "This project took our TCosy innovation forward to an offsite manufactured panel. This has greatly increased the speed of works and with further innovations we expect to see the process become quicker and more affordable. "We have received many positive comments from the tenants of our retrofitted properties who are already enjoying a warmer, healthier Passivhaus living environment as well as reduced energy bills." Birmingham City University provided simulation design analysis of the houses, tracked their carbon outputs and InteSys Ltd developed a predictive control system which learns physical characteristics of the building and delivers the right amount of heat at the right time. Thermal imaging and 3-D laser scanning formed a part of detailed pre-retrofit survey that enabled the creation of design simulation models to help plan the best way to achieve a zero-carbon rating and monitor the changes in energy consumption. Professor Lubo Jankovic, Head of the Zero Carbon Lab at Birmingham City University's School of Architecture and Design, said: "Retrofit plus has been shown to reduce heating energy consumption and carbon emissions by 80 per cent, saving money for residents and providing a process suitable for a UK-wide scaling-up. "Our experience from this project shows that there is a behaviour change with occupants with increased internal temperatures and fewer warm clothes needed in winter. This approach improves health and wellbeing of occupants and positively changes their lives." The houses have now formally been handed back to Birmingham City Council but their energy use will continue to be monitored until later this summer. This is better than building and fueling more powerplants.